In 1929, Kenneth Mallory and Soma Weiss first described a syndrome characterized by esophageal bleeding caused by a mucosal tear in the esophagus as a result of forceful vomiting or retching. The initial description was associated with alcoholic binging; however, with the advent of endoscopy, Mallory-Weiss tears have been diagnosed in many patients with no antecedent history of alcohol intake. The tear typically occurs after repeated episodes of vomiting or retching, but it may occur after a single incident. Although most written reports of these tears relate to adults, Mallory-Weiss tears also occur in children. In pediatrics, Mallory-Weiss tears are recognized in children with predisposing medical conditions, including portal hypertension, liver cirrhosis, and severe gastroesophageal reflux disease. The clinical implications in these pediatric patients are noteworthy, especially because these children are predisposed to recurrent upper GI bleeding. The associated risk of morbidity and mortality must also be underscored. Examples of Mallory-Weiss tears are shown in the images below. Mallory-Weiss tear. 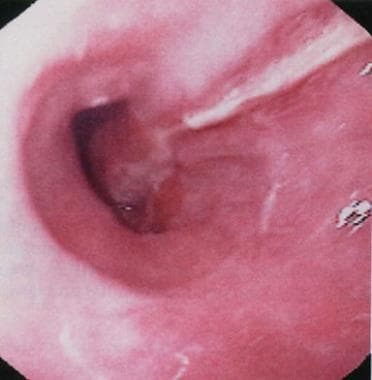 Typical longitudinal mucosal tear with overlying fibrinous exudate extending from the distal esophagus to the gastric cardia. Courtesy of C.J. Gostout, MD. Mallory-Weiss tear. Retroflexed view of the cardia showing the typical location of the tear with a clean base. 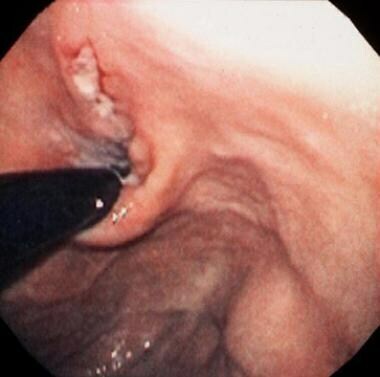 Any disorder that initiates vomiting may result in the development of a Mallory-Weiss tear, which develops as a linear laceration at the gastroesophageal junction because the esophagus and stomach are cylindrical. The cylindrical shape allows longitudinal tears to occur more easily than circumferential tears. These tears have been postulated to occur either by a rapid increase in intragastric pressure and distention, which increases the forceful fluid ejection through the esophagus, or secondary to a significant change in transgastric pressure (ie, difference in pressure across the gastric wall) because negative intrathoracic pressure and positive intragastric pressure leads to distortion of the gastric cardia, resulting in a gastric or esophageal tear. Aside from those patients who present with upper GI bleeding secondary to an alcohol binge, Mallory-Weiss tears occur more commonly in people with hiatal hernias. Although most cases of Mallory-Weiss tears are self-limiting, patients with severe or recurrent episodes of bleeding that require intensive care therapy and interventional endoscopy have been reported. Typically, these patients have underlying conditions, including portal hypertension and hepatic insufficiency. Although upper GI bleeding is generally assumed to be secondary to varices in these patients, the physician must also be aware of the potential for Mallory-Weiss tears. Mallory-Weiss tears cause approximately 3-15% of all episodes of hematemesis in adults; however, these tears are less common in children (< 5% of all upper GI bleeding episodes). Although children rarely have hemodynamic instability secondary to upper GI bleeding associated with Mallory-Weiss tears, the risk for potential complication, including shock, must be underscored in patients with portal hypertension and hepatic insufficiency. Mallory-Weiss tears are equally common among male and female children. These tears also occur with equal frequency in both sexes in adults, although they have different causes. In women of childbearing age, the most common cause of these tears is hyperemesis gravidarum, which usually occurs in the first trimester, causing severe persistent nausea and vomiting. Any adolescent female presenting with a Mallory-Weiss tear should be evaluated for pregnancy, as well as bulimia and anorexia nervosa. Furthermore, the potential for drug and alcohol ingestion must also be underscored in the adolescent patient. Mallory-Weiss tears usually occur in the fifth and sixth decades of life. In children, tears are more commonly observed in older children and adolescents secondary to increased intragastric and transgastric pressures that develop at an older age. However, children with underlying medical conditions, including gastroesophageal reflux and liver disease, can present at any age. Graham DY, Schwartz JT. The spectrum of the Mallory-Weiss tear. Medicine (Baltimore). 1978 Jul. 57(4):307-18. [Medline]. [Guideline] Millward SF, Bakal CW, Weintraub JL, et al. Treatment of acute nonvariceal gastrointestinal tract bleeding. [online publication]. Reston (VA): American College of Radiology (ACR); 2006. [Full Text]. Harris JM, DiPalma JA. Clinical significance of Mallory-Weiss tears. Am J Gastroenterol. 1993 Dec. 88(12):2056-8. [Medline]. Ljubicic N, Budimir I, Pavic T, Bišcanin A, Puljiz Z, Bratanic A, et al. Mortality in high-risk patients with bleeding Mallory-Weiss syndrome is similar to that of peptic ulcer bleeding. Results of a prospective database study. Scand J Gastroenterol. 2014 Apr. 49(4):458-64. [Medline]. Yu PP, White D, Iannuccilli EA. The Mallory-Weiss syndrome in the pediatric population. Rare condition in children should be considered in the presence of hematemesis. R I Med J. 1982 Feb. 65(2):73-4. [Medline]. Akhtar AJ, Padda MS. Natural history of Mallory-Weiss tear in African American and Hispanic patients. J Natl Med Assoc. 2011 May. 103(5):412-5. [Medline]. Ament ME, Gans L, Christie DK. Experience with esophagogastro-duodenoscopy in diagnosis of 79 pediatric patients with hematemesis, melena or chronic abdominal pain. Gastroenterology. 1975. 68:858-61. Countryman D, Norwood S, Andrassy RJ. Mallory-Weiss syndrome in children. South Med J. 1982 Nov. 75(11):1426-7. [Medline]. Kerlin P, Bassett D, Grant AK. The Mallory-Weiss lesion: a five-year experience. Med J Aust. 1978 May 6. 1(9):471-3. [Medline]. Kim JW, Kim HS, Byun JW, et al. Predictive factors of recurrent bleeding in Mallory-Weiss syndrome. Korean J Gastroenterol. 2005 Dec. 46(6):447-54. [Medline]. Fujisawa N, Inamori M, Sekino Y, Akimoto K, Iida H, Takahata A, et al. Risk factors for mortality in patients with Mallory-Weiss syndrome. Hepatogastroenterology. Apr/2011. 58:417-20. [Medline]. Ivekovic H, Radulovic B, Jankovic S, Markos P, Rustemovic N. Combined use of clips and nylon snare ("tulip-bundle") as a rescue endoscopic bleeding control in a mallory-weiss syndrome. Case Rep Gastrointest Med. 2014. 2014:972765. [Medline]. [Full Text]. Lecleire S, Antonietti M, Iwanicki-Caron I, et al. Endoscopic band ligation could decrease recurrent bleeding in Mallory-Weiss syndrome as compared to haemostasis by hemoclips plus epinephrine. Aliment Pharmacol Ther. 2009 Aug 15. 30(4):399-405. [Medline]. Cho YS, Chae HS, Kim HK, et al. Endoscopic band ligation and endoscopic hemoclip placement for patients with Mallory-Weiss syndrome and active bleeding. World J Gastroenterol. 2008 Apr 7. 14(13):2080-4. [Medline]. [Full Text]. Park CH, Min SW, Sohn YH, et al. A prospective, randomized trial of endoscopic band ligation vs. epinephrine injection for actively bleeding Mallory-Weiss syndrome. Gastrointest Endosc. 2004 Jul. 60(1):22-7. [Medline]. Kelly JA. Mallory-Weiss tear. Altschuler SM, Liacouras CA, eds. Clinical Pediatric Gastroenterology. Philadelphia, Pa: Chuchill-Livingstone; 1999. 303-5. Higuchi N, Akahoshi K, Sumida Y, et al. Endoscopic band ligation therapy for upper gastrointestinal bleeding related to Mallory-Weiss syndrome. Surg Endosc. 2006 Sep. 20(9):1431-4. [Medline]. Shimoda R, Iwakiri R, Sakata H, et al. Endoscopic hemostasis with metallic hemoclips for iatrogenic Mallory-Weiss tear caused by endoscopic examination. Dig Endosc. 2009 Jan. 21(1):20-3. [Medline]. The authors and editors of Medscape Reference gratefully acknowledge the contributions of previous author Chris A Liacouras, MD, to the original writing and development of this article.